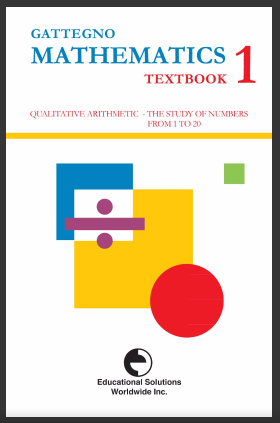 This blog post continues my series on Gattegno's Mathematics Textbook 1 with number studies. We're in chapter 6 in number studies. The post will cover three activities for number study using number 11: find all two rod trains for a given number, write trains in various forms, and find the missing number. It seems like a lot to cover in one post, but I am doing it in one post because it is one lesson for us and takes about 20 minutes. As I mentioned before, we are going to cover all activities that Gattegno uses for number study to study the number 11 instead of following the activities in the book. daughter was having trouble with problems that require her to find the missing number and the parent didn't know how to help. That's something we want our kids to work on because they're going to need it for an official algebra course when they get older. 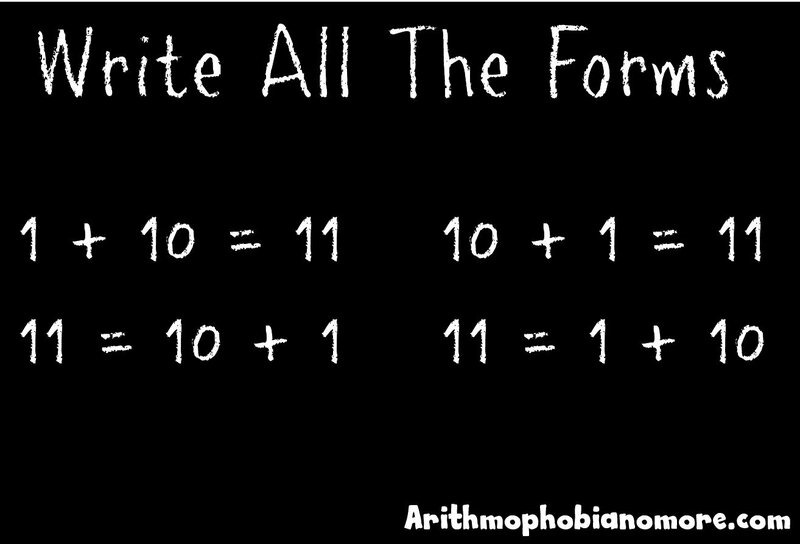 We all remember this exercise: 3 + x = 7. What is x? Show your work. I know what I would do to solve this problem. I would use Gattegno and Cuisenaire Rods. But I was curious as to how other teachers solve this issue so I Googled it. As I went down "find the missing number" rabbit trail, I discovered something else. Teachers are encouraged to write equations in different forms so that students get used to seeing them. Why? We don't want children to think that the equal sign is a signal that tells the the student that the answer comes next. Have I said I love Gattegno lately? I love Gattegno. 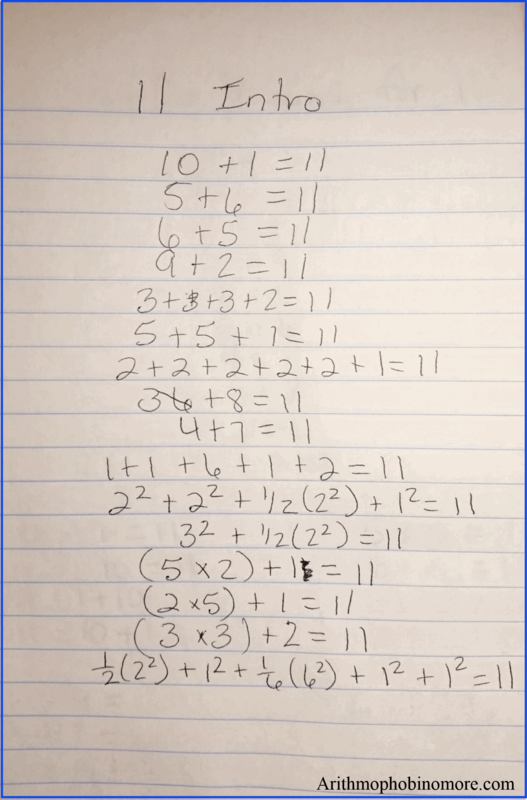 These two exercises: finding the missing number and writing the various forms of an equation are the very first steps to studying a number the Gattegno way. You'll see that it makes a lot more sense to the student if the student is the one doing all the heavy lifting. Don't create it in the first place! I know, sounds crazy right? How about "the answer comes next syndrome"? Don't create it in the first place! Double crazy, right? What do we do instead? We stop handing math language to our children predigested and written for them. We stop giving them 30 problems for which they are required to find the answer. They are perfectly capable of generating all the math that they do. 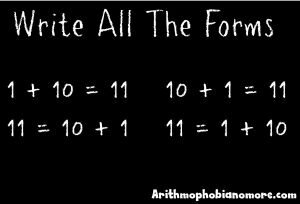 When we are done with the number 11, you'll be surprised at all the math comes out of your child. Introducing a Number: Last post, we introduced the number 11 and created random trains for it. We practiced reading those trains in different ways. I asked P. to find a train or two that was on his pattern: show me the train that is 1/2 of 12 plus 5. I wrote all of P's trains in his math notebook, the image appears above. Generate All The Two Rod Trains for A Number: This exercise should be familiar to your student by now. We've been doing it since chapter 2 of Gattegno's Textbook 1. By this time, your student should have a system for making sure that they have all two rod trains. The most easy system is to create a staircase. The student should read all the two rod trains and write them in her math notebook or you can scribe them. Write the Trains in Different Forms: Once your student has generated all the two rod trains and they are written in his math notebook, he can pick 4 - 6 trains and rewrite them in all their forms. Place those written forms in the math notebook. Notice that the teacher isn't changing how the teacher writes the forms. Notice also that the statements don't come prewritten in a book for the student to supply the answers. There are examples in a book, but the student provides the majority of written work. 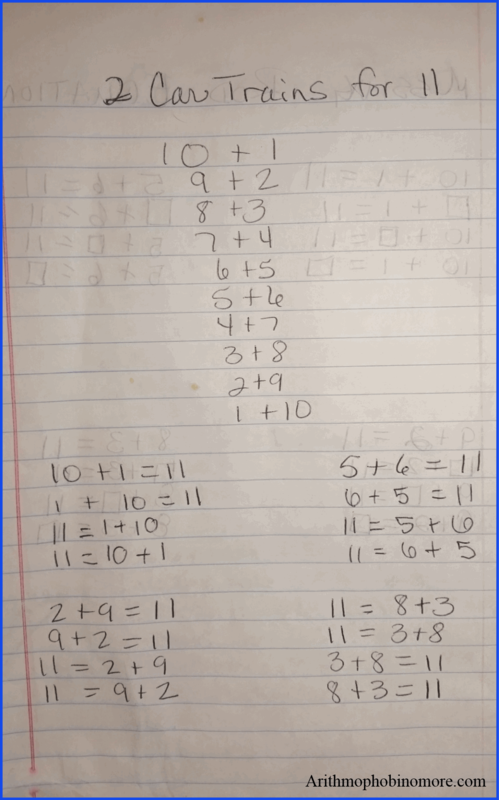 The student generates all of this math by herself. Rewriting more than 4 - 6 equations in their various forms is unnecessary and will become boring to the student. We want to avoid boredom. The point is to engage the child and get them thinking; and to become fluent and creative in their mathematical communication and use of mathematical symbols. Rewrite Trains With A Missing Rod: Gattegno kids have been creating and solving missing rod problems for four chapters. We started by taking two rods of different lengths placing them side by side, and finding the rod that would make the lengths equivalent. This step is important as it allows the child see what is happening long before we start adding the mathematical language. What we've done is create a manipulative to symbols progression that will eventually easily allow us to transition to using a variable. First we used just the rods, then we worked with letters back in chapter 3, and now we come at it again with number study. Because your student, back in chapter 3, created her own expressions using a missing rod, this will seem like an old familiar friend to her. 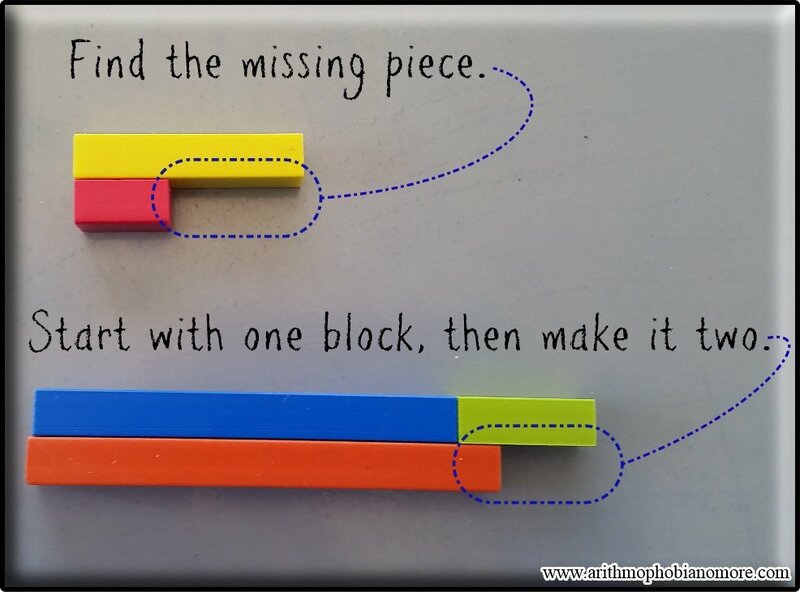 By now, your student should not need rods to work out the missing number. Instead, he should be able to do this as a mental exercise. 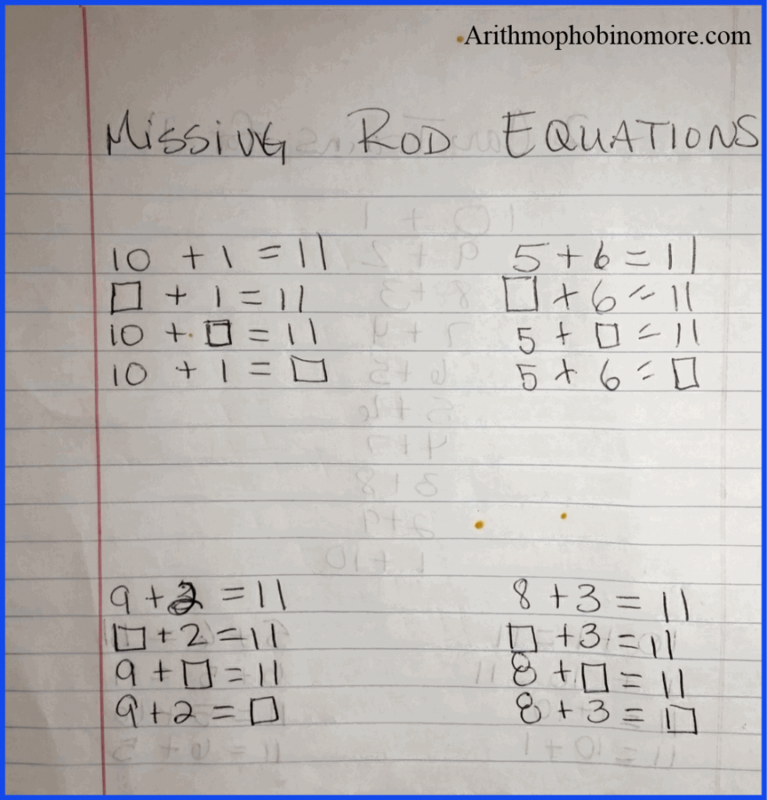 If your student discovered a way to work through missing rods systematically - back in chapters 3 or 4, it should be no trouble to recite missing rod variations without looking at the rods. Choose four expressions to rewrite (or recite for mom to scribe) with missing rods. For the number 11, we choose four of the two rod trains. We could have chosen statements from the Different Forms work we did earlier - it wouldn't have mattered. Just rewrite some equations with missing numbers. We do this again when we find all the three rod trains and when working with multiplication, division, and fractions. If you choose to rewrite four 2-rods trains with missing numbers, your student should now have twelve equations with missing numbers. If your student choose to use the expressions he rewrote in different forms, you have 3 equations per form. That is 12 equations with missing numbers for each 2-car train. Which means there are 60 possible equations with missing numbers for the number 11. This is only working with two rod trains. Here is the really slick part. A week from now, you will return to this page of equations with missing numbers, that your child wrote, and ask him to find the missing numbers. I won't hand this sheet to P. but I will take one equation from each of the sets and put it up on a white board to solve. Rewrite In Different Forms and Rewrite with a Missing Number are tools for your tool chest. Math statements of all kinds can be rewritten in different forms not just two car trains. The same is true for Rewriting with a Missing Rod. As we continue in our number studies, you will see how we come back to these two tools and apply them to more complex statements. Our goal is to help students become proficient at manipulating the numbers and the signs. This doesn't happen if we are the mediator between them and mathematical language. The only way our children become proficient is if they are using math language to communicate their ideas about math, generate their own math statements and solve their own math problems. Every time I am in a classroom and am told that the pupils find it hard to put down their work in writing, I note that in reality these children never write but only draw signs, the adult constantly taking their place in the work of production of the language and the notation. What actually takes place is the following: pupils manipulate the rods, answer a question with a word and are suddenly told to 'go and write it' without previously formulating for themselves and completely the relationship required. This explains why these children at the blackboard constantly need the help of their teacher who says: "Write this...now put that sign...put down that figure next...' and so on. The fact is that it is the teacher who writes, the child becoming a mere instrument whose role is simply to make material marks of chalk or pencil on a writing surface. I am trying to find the amazing video showing math operations with lots of 1’s on little paper squares and the number line. I have been so inspired by your blog. I will be implementing many of the activities I have learned from you. Did you see it on this blog or perhaps youtube? I don’t recall doing that. If I come across it, I will let you know. I am glad you are enjoying the blog, I would love to claim these ideas are mine, but they aren’t. It’s Cuisenaire Rods and Gattegno. I just realized what you are talking about. Vi Hart and Logarithms.